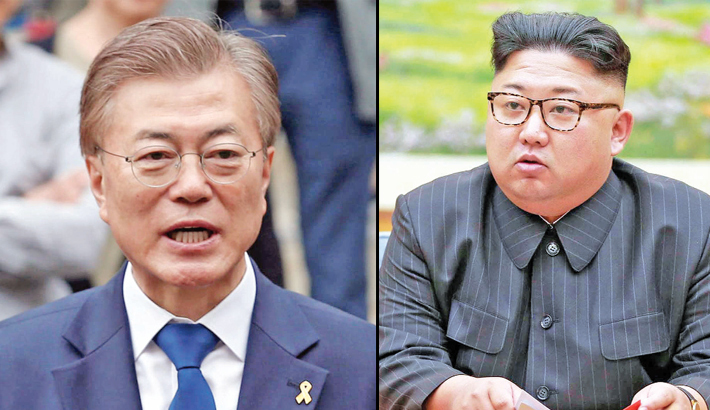 PARIS: South Korean President Moon Jae-in said Monday that world powers needed to reassure North Korea’s Kim Jong Un that he had taken the right decision to commit to denuclearisation on the Korean peninsula, reports AFP. Moon, who has met Kim Jong Un three times this year, was set to convey the message to French President Emmanuel Macron in Paris on Monday as part of a seven-day European tour that will see him also stop in Rome, Brussels and Copenhagen. Moon told Le Figaro newspaper, in comments published in French, that Kim had “expressed his frustration at the continued scepticism of the international community” during their talks. “We have to reassure Kim Jong Un that he has made the right choice in denuclearising and we need to support his desire for durable and solid peace,” Moon added. Moon, who met the North Korean leader in April, May and September, was instrumental in brokering a historic summit in Singapore between US President Donald Trump and Kim in June. But some analysts believe the dovish South Korean leader has gambled too much on securing an end to hostilities on the peninsula and has so far secured only minimal concessions from Pyongyang.